We’ve put together a reading list of five powerful books on diversity and inclusion in the workplace. These books tackle important topics such as confronting personal and systemic bias, navigating difficult yet necessary conversations, creating safe spaces, and providing the tools for empowerment and fostering a sense of belonging. For anyone working to confront their personal biases or to make their organization a more inclusive and welcoming place, these are the resources that will give you actionable tools and inspiration to keep you—and the conversation—going. 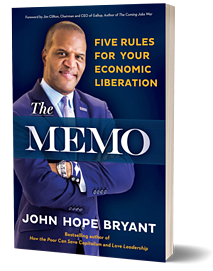 Bryant offers tools for empowerment by covering everything from achieving basic financial literacy to investing in positive relationships and approaching wealth with a completely new attitude. When your people feel economically empowered and seize the opportunities for true wealth, we all win. Whether we’d like to admit it or not, everybody’s biased. This simple fact can be seen as both good news and bad news: we all harbor unconscious assumptions that can get in the way of our good intentions and keep us from building authentic relationships with people who are different from us. When these biases go unchecked, they can balloon out to the social “isms” that reproduce systems of power and oppression. Overcoming Bias tells vivid stories and even provides fun (yes, fun!) exercises and activities to help us reflect on our personal experiences and uncover how our hidden biases are formed. By becoming more self-aware, we can control knee-jerk reactions, conquer fears of the unknown, and prevail over closed-mindedness. 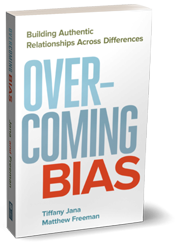 Building upon the revelatory power of their book, Overcoming Bias, which addressed managing individual and interpersonal bias, Erasing Institutional Bias scales up the framework to impact systemic change in organizations. Authors Tiffany Jana and Ashley Diaz Mejias confront specific topics, such as racism, sexism, hiring and advancement bias, and retribution bias, which means that organizations develop a culture of aggression, and offer solutions to identify and control them. Tiffany Jana, founder of TMI Consulting and co-author of The B Corp Handbook, 2nd edition, has been working tirelessly to better educate and instill a holistic approach to diversity and inclusion work, directly confronting the common misconception that D&I programs need to be siloed away from the work that the organization is doing as a whole. With this all-in approach, TMI Consulting and B Lab have issued a call to action of the Inclusive Economy Challenge for leaders and organizations who want to face creating a world that works for all head-on. 3. We Can’t Talk about That at Work! Conversations about taboo topics, such as race, gender, and religion, happen at work every day and if they aren't handled effectively, they can become polarizing and divisive, impacting productivity, engagement, retention, teamwork, and even employees' sense of safety in the workplace. These conversations, when viewed as necessary and manageable rather than avoidable and tense, are also ground zero for impacting lasting change. The bottom line is that we need to talk about this at work in moving toward a world that works for all. So how can we ensure that they are productive rather than divisive? 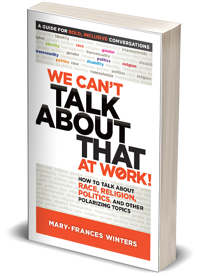 In We Can’t Talk about That at Work!, Mary-Frances Winters, founder of The Winters Group, shows how to deal with sensitive subjects in a way that brings people together instead of driving them apart. She helps you become aware of the role culture plays in shaping people’s perceptions, habits, and communication styles and gives detailed guidance for structuring conversations about those things we’re not supposed to talk about. Preparation is crucial—but so is intent. Winters advises you to “come from your heart, learn from your mistakes, and continue to contribute to making this a more inclusive world for all. Nurturing a workplace culture that has high levels of interaction safety isn’t simply a “soft” promise—it’s a business imperative. Some organizations pay a great deal of attention to ensuring the physical safety of their team members, but do the team members feel safe enough to speak up and raise tough concerns? Do they share bold and still-in-formation ideas? 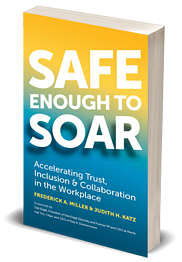 In this book, bestselling authors and inclusion experts Frederick A. Miller and Judith H. Katz introduce the concept of “interaction safety” and demonstrate how it can help create a work environment of trust, inclusion, and collaboration in their latest book, Safe Enough to Soar. When interaction safety exists, people know they will not be penalized, ostracized, demoted, made small, discounted, or shunned because of their thoughts, contributions, and conversations. Individuals feel encouraged and empowered and can achieve more together than they would alone. Miller and Katz provide a four-level model for assessing and increasing interaction safety in organizations, illustrated by short scenarios taken from real-life situations. They offer concrete actions that team members, leaders, and organizations can take to build and maintain a productive, collaborative, and innovative environment in which people do their best work individually and collectively. Howard Ross, bestselling author of Everyday Bias and co-founder of Cook Ross Inc, returns with a hard-hitting analysis of the mounting tensions as a result of political tribalism, which drive people apart. Our Search for Belonging tracks the rise of tribalism and regurgitates the narratives of life to which we are exposed on a daily basis and which become echo chambers in which we hear our beliefs reinforced and others’ beliefs demonized. At the core of tribalism, there exists a paradox: as humans, we are hardwired with the need to belong, which ends up making us deeply connected with some, yet deeply divided from others. When these tribes are formed out of fear of the “other” on topics such as race, immigration status, religion, or partisan politics, we resort to an “us versus them” attitude. Especially in the digital age, when we are all interconnected in one way or another, these tensions seep into our daily lives and we become secluded with our self-identified tribes. Drawing upon decades of leadership experience, Ross probes the depth of tribalism, examines the role of social media exacerbating it, and offers tactics for how to combat it. 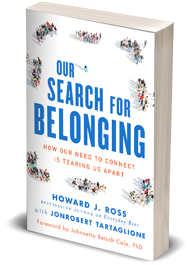 Filled with tested practices for opening safe and honest dialogue in the workplace and challenges to confront our own tendencies to bond with those who are like us, Our Search for Belonging is a powerful statement of hope in a disquieting time. If you're doing the difficult work to make your workplace more diverse, equitable, and inclusive, you know better than anyone about the long and difficult road you have ahead. We hope these books and resources are helpful and keep you going! If you have another book you like, tell us about it in the comments!